Copy as HTML allows you to copy HTML from Safari and other Webkit-based apps and paste it into browsers such as Firefox, Opera and web development tools like Adobe Dreamweaver. Currently apps such as Firefox, Opera and Adobe Dreamweaver does not support HTML from the Safari clipboard (webarchive clipboard format). Copy as HTML solves this issue by checking for the clipboard content periodically and convert the webarchive clipboard format to HTML clipboard format, so you can copy and paste HTML between the apps seamlessly. Copy as HTML also provides a “Copy as HTML” service, so you can disable the auto check and copy the selected web content as HTML manually. 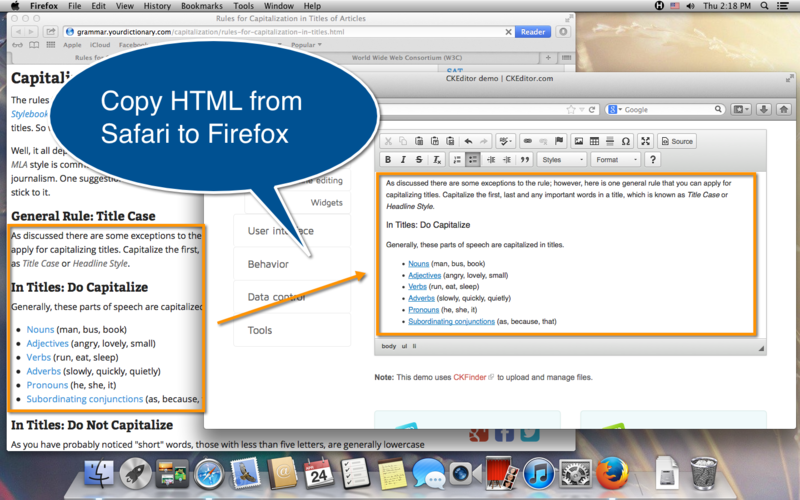 If you are a web developer or a blogger who use Firefox or Opera constantly, Copy as HTML is for you!